Although everyone worries about their skin during the winter, I’ve always found summer to be more challenging. With the hot weather and scorching sun you have to not only figure out how to keep or increase moisture in your skin, but you have to account for increased sweatiness, oiliness, and increased usage of sunscreen. This leads me to sharing my Sunday trio, 3 steps that work as my weekly “restart” button to get my skin back into shape for the week ahead. This is one of the best powder to cream masks I’ve experienced. As is to be expected with YÜLI, there is a level of thoughtfulness and sophistication here that is quite special. The airy texture of the powder is super-fine that once activated with water turns into a silky cream that applies effortlessly onto skin. The reason this works so well for summer is because the ingredients have a cooling and soothing effect thanks to traditional Asian botanicals like mung bean, green tea and goji berries. When my skin is red, overheated, congested, or feeling gross in general from the effects of summer, this is like a cool smoothie for my skin – filter out the bad stuff, chock full of the good stuff. I am absolutely obsessed with this product. Like all Tatcha products, the presentation is beautiful but more so – the memory serum concentrate has such a unique formula where the texture is like a cross between a soft Japanese tofu and JELLO. Even when I scoop over some of the concentrate, the formula refills the areas I just scooped – how cool is that?! So moving beyond that, the reason I love this is because it is essentially the ultra-concentrated form of Tatcha’s Luminous Dewy Skin Mist that is universally loved (it was even recently featured on Kylie Jenner’s snapchat). So this is THE product for getting hydration into skin and to accelerate recovery from a day out – making it the perfect pairing to the Pure Mask. This is a dreamy, rich day cream that helps with dryness and dehydration, and it is the final step to seal in all of the good stuff from the first two steps. While the thickness may deter some, I love the way the creaminess just melts away into skin leaving it feeling only nourished without heaviness. This is definitely a very high quality product that is very rich with organic oils, aloe, and probiotics which keep skin surface healthy. Simply a pleasure to use. Tata Harper Purifying Cleanser: As a first step, this cleanser smells lovely and gets rid of make-up/sunscreen build up. It washes off as a milky fluid making removal easy. Good for a quick removal or extended massage. Use in place of a balm which might prove too heavy for Spring/Summer. Pro-tip: Apply on dry skin and cleanse before washing. The times I used this in the shower resulted in cleanser washing immediately into my eyes as I believe this cleanser is designed to break down with continued water exposure. Kypris Moonlight Catalyst: A gentle resurfacing treatment that sloughs away dead skin cells and exfoliates dead skin cells that perhaps have been trapped under all the oils and moisturizers from winter. 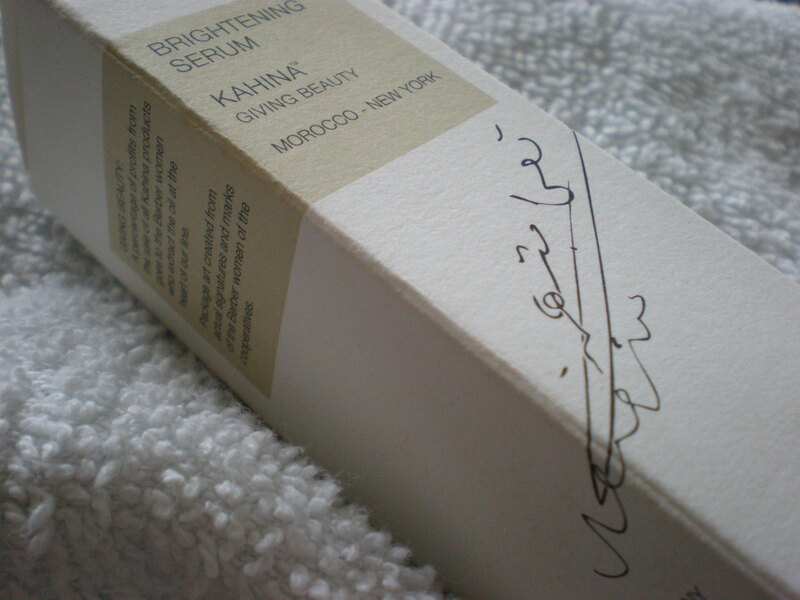 A night-time only serum, apply before face oil for best results. Pro-tip: The older version which is more of a brownish-orange hue seemed to work better for me and the new version which is clear seems much more mild. Both versions seem to work best when slightly heated in hands first. Dry/delicate skin should use this 1-2 times a week as too much exfoliation can be counter productive and reveal thin/crepy skin. I’ll provide a more in-depth review comparing the two soon. YÜLI M.E. Skin Fuel: Spring is a season of change, meaning skin may be in flux. This face oil from YÜLI is incredibly high quality being made on site from really incredible ingredients that are beneficial for problematic or compromised skin – black cumin, broccoli seed, sea buckthorn, red raspberry, prickly pear and the formula is focused on balancing and optimizing skin. Deemed a multivitamin for skin and topped with a refined fragrant jasmine note, few will find anything to complain about with this versatile oil. Pro-tip: Apply to skin that is dewy. Oily and acne prone skins can actually put this anti-inflammatory oil on breakouts to speed up healing. 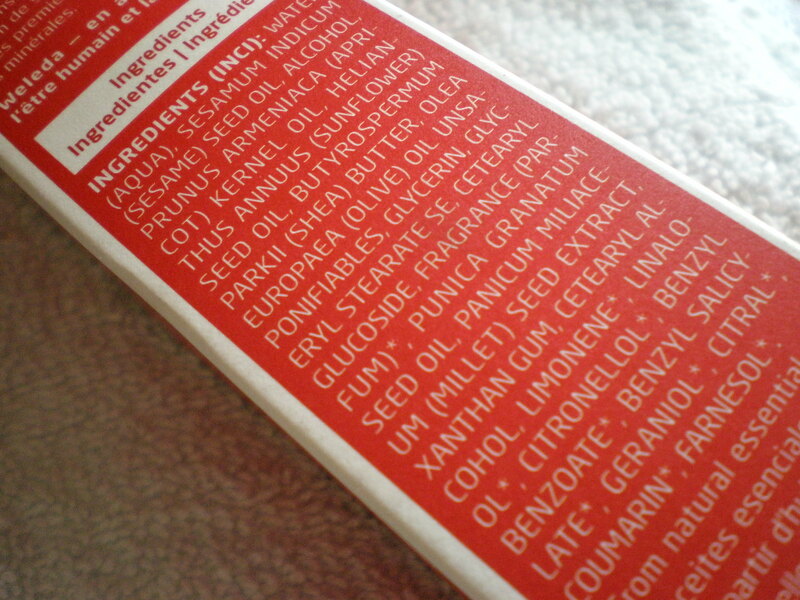 Red/irritated/sensitive skins will like this gentle formula as it contains actual anti-irritant extracts. Use the press/pull technique for maximum absorption. Kari Gran Lip Whip: Available in a variety of colors, the naked Lip Whip is a beautifully packaged, green lip balm that gives a viable option for us girls looking for an alternative from the Rodin and Omorovicza balms. The buttery texture is melt on your lips soft while providing a solid base to apply lip stains (or just opt for one of their lip tints). Wonderful to heal chapped lips from chronic winter dryness for supple Spring kissers. Pro-tip: layer under or dab and mix with heavily pigmented lip products (i.e. W3ll People, RMS, etc) to create a natural, moisturizing tint. Pro-tip: As lactic acid is an AHA, do not layer with oils or actives that can be easily broken down such as Vitamin C and Retinol. Use as either a 20 minute mask (2-3 full pumps) or alone in the evening with an inactive moisturizer. Kate Somerville Cytocell Eye Cream: My eyes are SENSITIVE. Origins/REN eye products make it red, oils always end up in my eyes and many of the luxury (non-natural) products can really irritate my eyes so when I find one that works, I stick with it, especially through Spring when pollen and allergens are at an all time high. This eye cream from Kate Somerville has been on my wish list for years before I could afford to spend $75 on an eye cream. The ingredients include Vitamin C, a milk peptide complex and Peptide P-199 that renews skin. It relieves, soothes and gives me confidence that somehow my eyes look awake even if I am not. Pro-tip: Stock in the fridge for added cooling benefits which helps with dark circles and firming. This cream glides onto skin so it can also be used as an eye make-up primer. YÜLI Halcyon: This cleanser is an all time favorite and is in the Spring Beauty Edit because 1) with a flower water base, it smells like spring in a bottle 2) Spring is the best season for bare skin and this cleanser is perfect for that quick, one-step cleanse to keep skin beautiful. Every wash leaves my skin naked but never stripped just super comfortable and plush. Pro-tip: The most luxurious cleanse I’ve had was by wetting skin with rose-water or face mist first before applying 3 full pumps of Halcyon and massaging skin. I do this every Sunday and my skin is baby soft, glowing, and pampered afterward. This gel cleanser is also superb when mixed with powder-to-cream masks. In Fiore Encens Vetivert Body Oil: Unfortunately not yet in stock from In Fiore, this seasonal body oil is one I am well and truly obsessed over. The body oil comes out in a green hue due to the grapeseed oil base and sinks into skin beautifully that it can be applied to dry or wet skin. In Fiore’s scents are phenomenal and their body oils almost double as perfume oils, each transporting the wearer. This one is perhaps my favorite: Vetiver, Neroli, Jasmine, Mandarin all shine. It’s a floral heaven with some edge due to the grassey Vetiver note. Pro-tip: Apply as a hair oil and do a weekly scalp massage with this oil. Not only do I find it beneficial for my hair and scalp, but it helps keep the scent ruminating all around. What products have you put on the back burner and what are your staples for Spring? Leave your thoughts in the comments section! This travel sized version of one of my favorite cleansers was a Black Friday deal. I’ve since poured the full size product in here whenever I need to travel. I am slightly guilty of treating the open bottle as an aromatherapy due to the residing uplifting fragrance from cleanser. Especially when I travel I don’t really have time to rub a oil or balm all over my skin and hope water washes it off (I tend to breakout more when I travel) so Halcyon is perfect because I can always rely on it to clean my skin without leaving it stripped. For some reason the mini version just feels so adorable and cool that sometimes even at home I use this over the full size bottle. Truth be told, there is no reason the 50ml bottle isn’t travel friendly but I just find the little bottle much more discreet for the plane or on roadtrips. I run out of this so quickly since it is always on me, I find myself finding every excuse to use it, half the time my skin doesn’t even need it to refresh and I’m just trying to get a whiff of the beautiful scent. Either way, at the end of the day my skin looks flawless, no dryness from baking in the sun (not deliberately of course) but also no grimy oiliness. Recently reviewed and much beloved for it’s versatility, this simple yet high quality oil is wonder for travel when skin may be irritated and misbehaving. I find that it provides pretty good moisturizing on its own at night and also wears well during the day. Although this isn’t a sample size, the 15ml bottle means it’s pretty good for taking on trips. I just saw that the relaunched this in a larger size as well! These little packets are good for 3-4 uses for my skin since too much will leave my pores a little clogged after a few uses, while a little of the cream is perfect for keeping away any hints of dryness in case I don’t get enough water or travel somewhere especially arid. 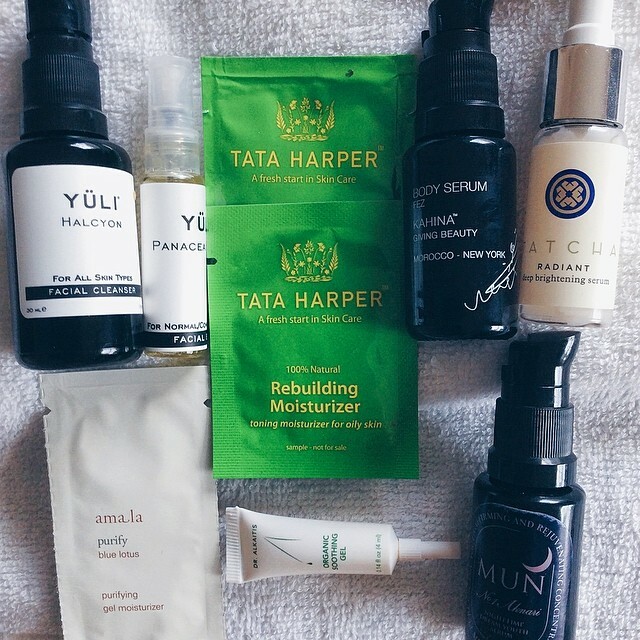 The rebuilding moisturizer makes me feel like a sophisticated lady who lunches from the what I consider signature Tata Harper fragrance to the pampered way skin feels after. In fact, putting it on makes me feel like I’ve made it in life even if just for a moment until the scent fades. So no one wants sun damage right? And pesky imperfections? Let’s try to keep those from being visible too. This little travel bottle of the Deep Brightening Serum is perfect for doing some work even when you’re on a vacation. The best part is that this serum layers well under everything from oils to moisturizers to sunscreen. It practically disappears once it is on so you never have to think about it. The only thing that should be noticeable is a brighter complexion when you return from your travels. Seriously, a body serum in a 15ml bottle is ADORABLE. There is just something about taking a full sized product, and keeping the appearance details the same yet shrinking it down that is so charming. Kahina’s Fez Body Serum comes in this perfect on the go bottle that makes taking care of dry arms and legs while traveling a breeze. 2 pumps per arm/leg and you’re set. And a bonus, the scent is sure to reawaken. Although much has been said about the spicy exotic fragrance that first greets you, I’m much more interested in discussing the cool down that leaves this distinct impression of ink. Se-duc-tive. These two samples serve the same purpose which is preventing break outs and any other anomalies that can happen when I travel. I find that typically changing diets/time zones and being out all day can leave my skin in a bit of a panic so these purifying/soothing gels are exactly what is needed to calm everything down. Where Dr.Alkaitis is like a natural astringent, Amala is more like a light moisturizer so if you want something gentle go with Amala, if you already have some breakouts then go with Dr.Alkaitis. What are your travel essentials? Do you also have a obsession with these charming minis? Well… we’re finally into summer! It’s funny how all year I long for summer: vacation, travel, etc. but when it actually comes around there is nothing I’d rather do than stay indoors! Well this long weekend I’m going to a wedding in the Hamptons so I know that I’ll need to have my best skin arsenal available, especially as the event will take place outdoors in the sun! VOSS: I admit, this is probably going to be finished on the ride over but it proves a point that hydration is the most important thing for keeping skin healthy and this is especially true during the summer when sitting under the bright sun. What makes VOSS great is that the bottle is glass (instead of plastic which can leak toxins), and it is recyclable – though I would not reuse this extensively since you can’t really clean it out. The water is also extremely pure with natural minerals that are good for skin. Tatcha Aburatorigami Beauty Paper: A must-have for summer to leave skin with a fresh complexion. This is essential for avoiding the dreaded oily-face in pictures especially at weddings where you’re dancing or sitting outside. These papers will last the entire night and best of all, they won’t smudge or move makeup so you won’t have to worry about frequent touch ups. YÜLI Liquid Courage: I very rarely use a product and think “this is really going to keep me as youthful looking as possible as I age” but Liquid Courage delivers that, and that is why despite testing different products – I have never strayed from this MVP. Check out their loaded mind-blowing list of ingredients to see why this deserves the acclaim. Layer this precious antioxidant serum under your moisturizer and sunscreen before you go out. 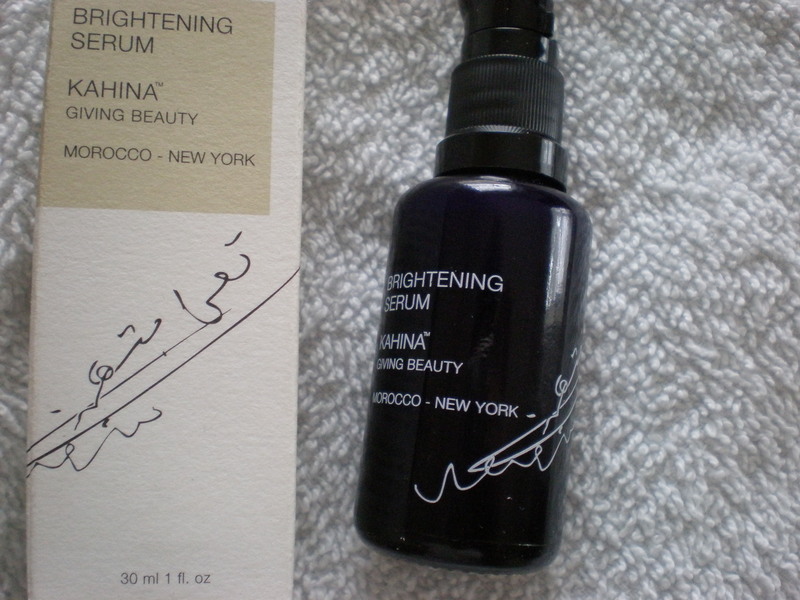 Also, apply this the night before a major event for that subtle glow and brightness that this serum always delivers. Coola Face SPF30 Cucumber Moisturizer: Why use two products when you can use one that does both jobs perfectly? Coola’s SPF30 Moisturizer is a beautifully made light cream that is both a moisturizer and a sunscreen with the recommended SPF30. The beauty of having two functions is that you won’t need to layer on products which is a blessing in the hot weather for blemish prone skin. And another bonus, Coola products are made with so many great ingredients that they’re actually called “organic suncare“, so the antioxidants in the naturals provide extra protection from UV rays that traditional sunscreens do not. There are some silicones in the formula but I’m used to this from lightwe sunscreens so I’m happy to make this trade-off. YÜLI Panacea Elixir: Clarifying? Check. Balancing? Check. Hydrating? Check. This is a blemish-prone skinned girls dream. I’m somewhat of a devotee to this elixir because it’s deceptively effective. At first, you think it’s just light refreshing floral waters until you see your pores shrink, your skin become refined, and your blemishes subsiding. It hydrates while it purifies your skin! As a true beauty junkie, I’ve drifted away from this to use mists that are cheaper (i.e. Evan Healy) and more expensive (i.e. Tata Harper) and after playing Goldilocks, the Panacea Elixir was just right. So at the wedding if you want me, I’ll be the girl shamelessly spraying away. 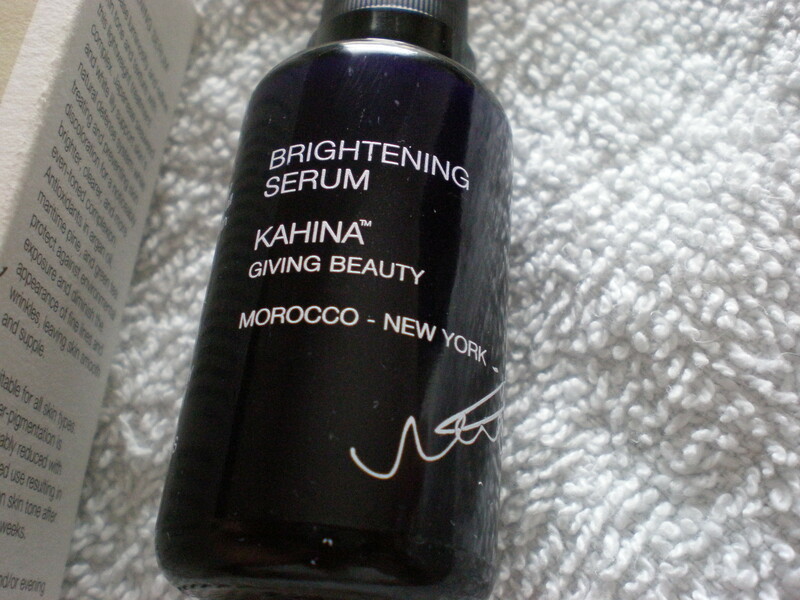 I first used Kahina’s Brightening Serum in the winter and you can read my initial thoughts here. As I started stockpiling products and rotated items in and out of my routine (such is life when you sell beauty products at one of the largest department stores! ), this little bottle got lost in the shuffle. 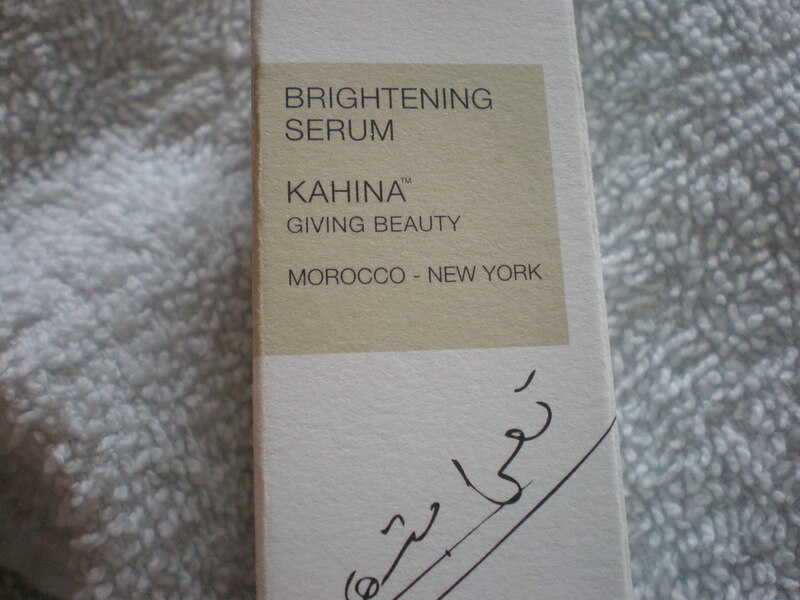 The Brightening Serum as I could remember, was great at what it did, but I just didn’t have a ‘need’ for it like some other people whose main concerns seem to be brightening their skin tone. However, a few weeks ago I rediscovered this and decided to use it regularly as kind of a makeshift moisturizer for my combination skin. Some of you see a ‘brightening’ product and immediately want to try it and others, don’t really ‘get it’. Granted, a brightening product isn’t as straight forward as a anti-aging product, moisturizer, or cleanser, but essentially brightening products are there to make complexion look its best. 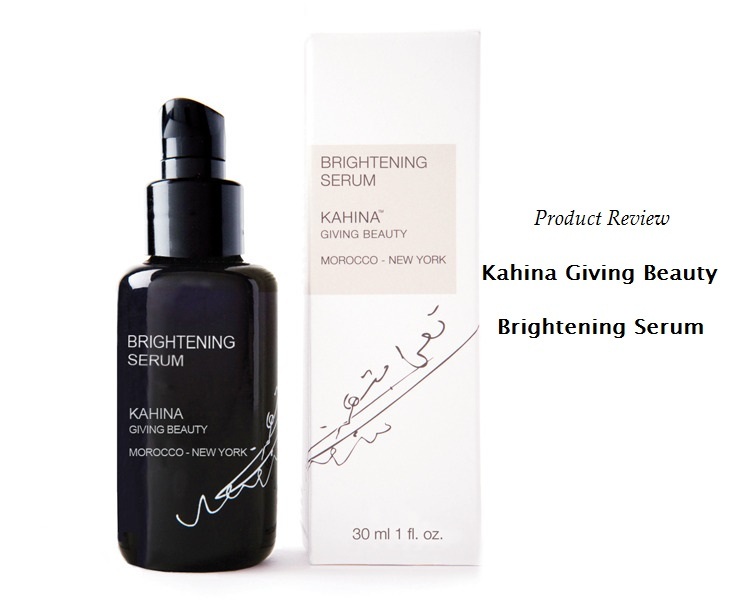 And Kahina Giving Beauty’s Brightening Serum does just that. The description promises to increase luminosity, refine skin tone & texture. It isn’t a product that ‘bleaches’ skin or anything like that and your skin will not change shades (if you are looking into those products, I’d urge you to reconsider), but it will make your complexion more even and refreshed. I’d describe this serum as having a milky, slightly sticky texture (the base of this serum consists of aloe leaf juice) that works best when combined with a toner and moisturizer. During the day, I like to layer a moisturizer with spf over it and at night, I pat on a facial oil which takes off the stickiness. The scent is light slightly minty thanks to a sandalwood oil and spearmint leaf extracts, but make no mistake, this is 100% clean, not a trace of a synthetic fragrance anywhere so it isn’t overwhelming which I love. For those with blemish prone skin, start slowly with 1 pump once a day to make sure your skin can adjust, I notice my skin is very hit-or-miss with Shea Butter products. You’ll want to massage this into skin thoroughly but otherwise I’ve been able to use this product without really breaking out (though when I do have active blemishes, I hold off using this until they have cleared). I found this to be the perfect compliment to my routine because the light texture and hydration benefits were just the right match for what my skin needed. On top of that, the brightening agents (including White Lilly, Japanese Wakame seawood, maritime pine, and antioxidants) make me feel like I’m also doing skin a lot of good on top of just moisturizing it. Some studies say that the most significant sign of aging is uneven skintone and hyperpigmentation, and so I feel that this is a good preventative measure to take! Another bonus is that this formula uses all 100% natural ingredients (73.8% organic) that won’t create photosensitivity as it brightens (in fact, Kahina recommends applying this during the day too to prevent dark spots from occurring) . This last point is important because a lot of brightening products on the market use actives that can generate free radical damage and photosensitivity which leaves skin extremely vulnerable and exposed. The fact that this actually works to refine complexion but also provide skin with protective benefits is wonderful, and truly speaks to the quality of ingredients in this serum. Those of you with sensitive skin should look at the extracts and essential oils to make sure they’re suitable for your skin, but this is kind of a overall suggestion I give for most products. People have different sensitivities and sometimes think that sensitive skin means they’re sensitive to all essential oils which just isn’t correct. Read the label, check to see if there are ingredients your skin might not like, and don’t just listen to other people talk about their sensitivities. My friend cannot use anything with Rosemary in it, so she cannot use this product, but my skin does not react to it at all. As summer rolls around, the heavy foundations in my beauty routine are going to move from the top shelf to the back of the shelf since it’s all about light, natural looks. You don’t want to have layers of product on during the sweltering summer heat! This multifunctional product will be a definite regular. 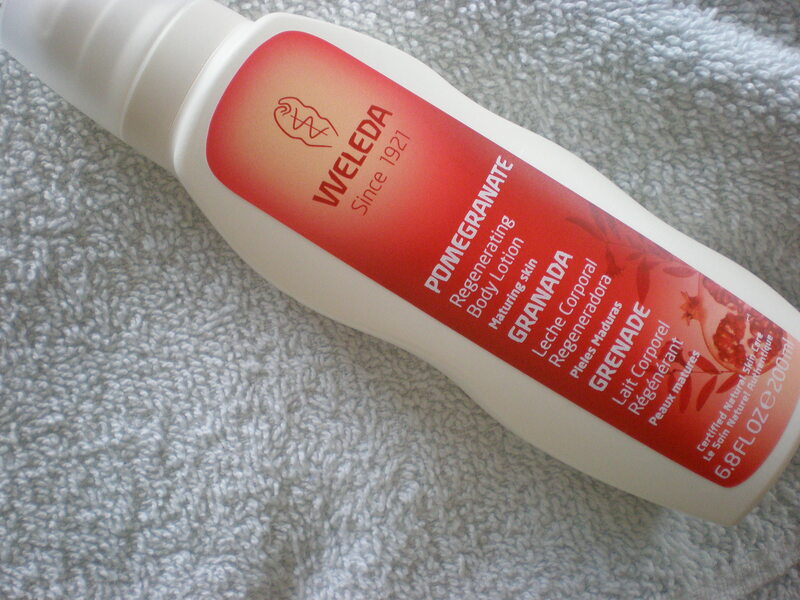 Weleda is one of my favorite “mass” green product companies. You’ll typically see them sharing shelf space with Dr.Hauschka, but their products tend to be priced lower. 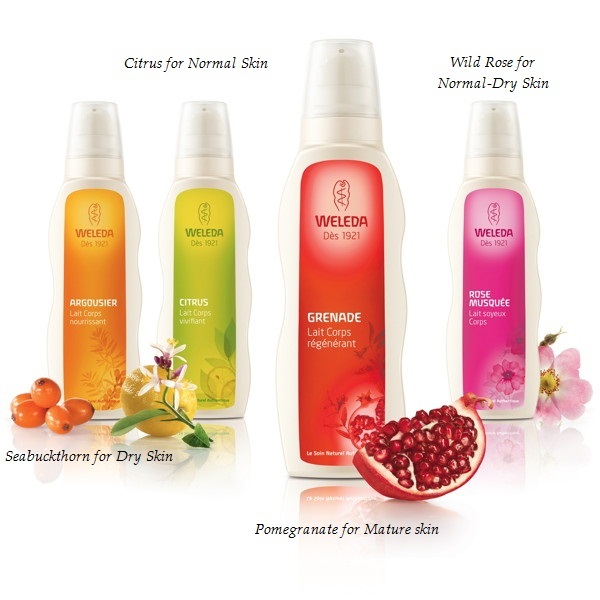 From my research, Weleda tends to use purer sources for their ingredients, relying on a lot of organic farms, which is to me, the key difference between them and Dr.Hauschka. This isn’t to say Dr.Hauschka products are inferior, the products are vastly different and so you will need to test them individually (luckily, they’re both carried at Whole Foods so that shouldn’t be too difficult for most people). I chose Pomegranate because to be honest, it smelled the best (Sea Buckthorn is another wonderful option but the other two were not my cup of tea). The scent is very subtle and light but wonderfully done to almost resemble the POM drinks which leaves you really happy when you get a whiff of it throughout the day. All the lotions were soft and absorbed quickly when I tested them at Whole Foods, so I decided to go home with the Pomegranate. My skin is finicky, while my face is blemish prone and combination-oily, my body has rough dry patches especially persistent roughness around my legs and elbows, so I was fine picking the mature skin lotion, besides, I could always use an antiaging boost since I want my body to keep up with my face. The bottle is made of high quality plastic with their label on, molded in the shape of their signature wave which gives it great grip and durability. The pump dispenses just the right amount and is very easy to control. Unlike a lot of pumps, you can tell the Swiss engineered this perfectly to not hold residue that can dry out the lotion. 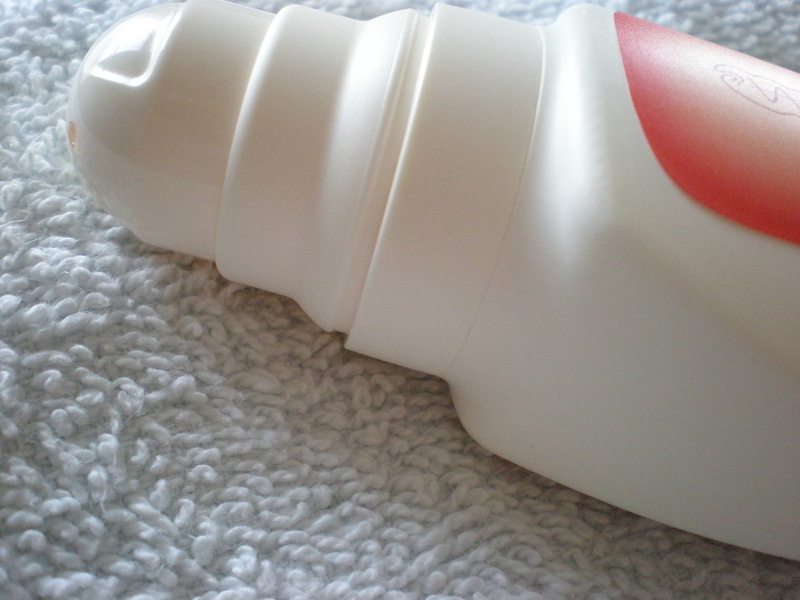 The lotion is a very silky yellow/beige cream with a comfortable emollient quality which helped it absorb quickly. When I applied this after my shower at night, I woke up the next morning seeing wonderfully happy skin without any rough patches or dryness. However, I do think that if I missed one application after showering, my skin might revert back so I would not mind more staying power. I feel like for a mature skin lotion, if I’m okay with it being stronger – then perhaps their body lotions in general need to be stronger since I’m only in my 20s and have relatively youthful / well moisturized skin as it is. Now let’s discuss ingredients. 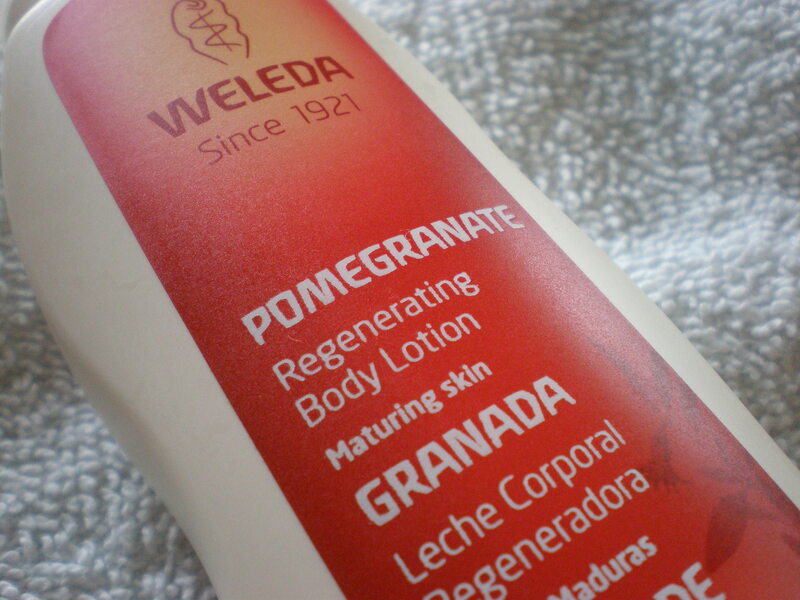 The Pomegranate Regenerating Body Lotion is 100% Natural/83% Organic. The composition of shea butter, pomegranate seed oil, apricot kernal oil, sesame seed oil, sunflower oil, olive oil are the anti-aging powerhouses that also provide hydration for ‘mature’ skin. I did find after regular use, that my skin felt less ‘thin’ so I do think there is some correlation between the cell-renewal qualities of the ingredients and my observation. 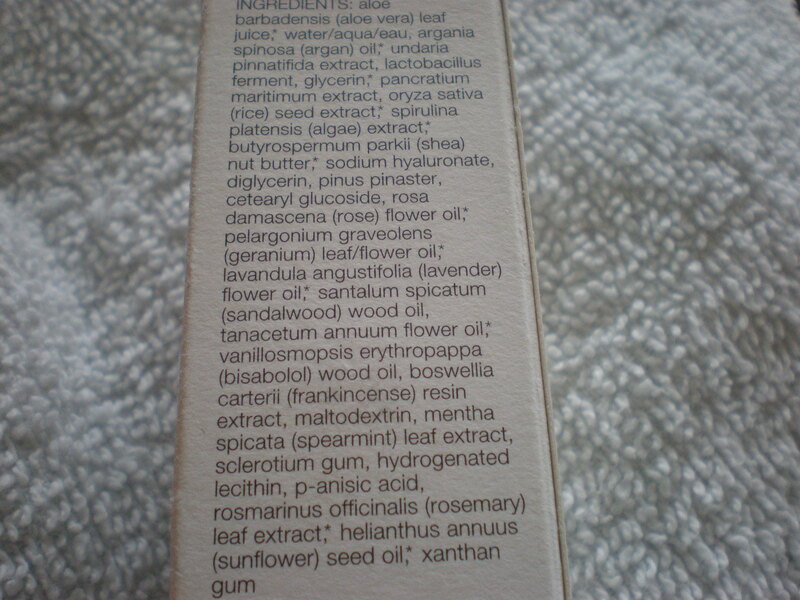 This cream uses 4 types of alcohols (not specified if it is grain based, which is the much better option) which also act as emulsifiers/emollients to help the formula maintain its silky consistency, there are some preservatives but notparabens/phenoxyethanol, and some fragrances dervied from natural sources such as Limonene which are better than synthetics but can be irritating so check if you have any sensitivities. Overall, this is a wonderfully formulated product that absorbs quickly and helps regenerate the body’s largest system. I truly do feel that my skin is stronger and that regular application of this product will ward off signs of aging until they have to happen. My skin is very happy. Going into the hotter summer months with no heating that causes dryness, I definitely think this will provide my skin with enough support. 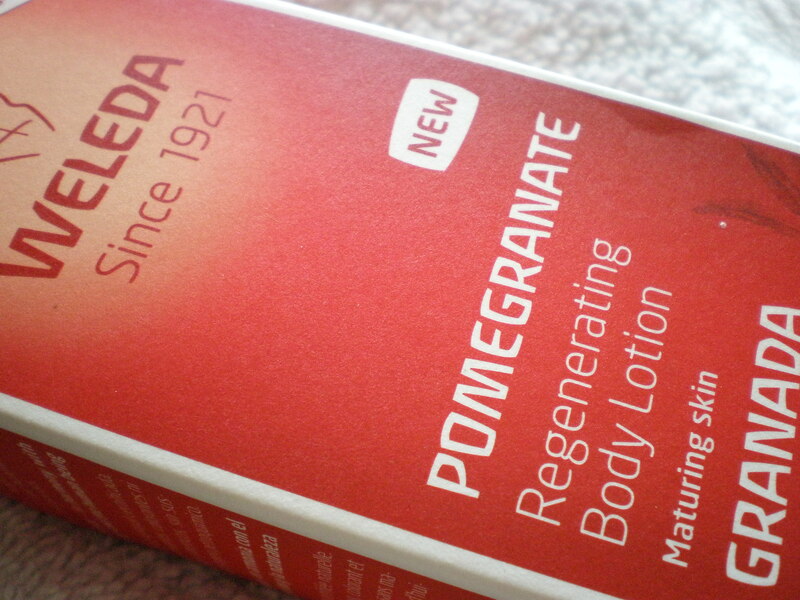 I may pick up another bottle of this or try the Sea buckthorn next, either way I plan to keep it in the Weleda family. Lately I’ve been on the hunt for gentle but effective serums that can kind of do-it-all. I have used Perricone MD products in the past and they’ve always been decent. They’re made by Dr.Perriocone, a Dermatologist known to many as the mind behind the anti-inflammatory diet to fight aging. His products aren’t the cleanest, but I’ve never really had an adverse reaction from using his stuff. One of his cult products, Cold Plasma is a staple for my mom, and for a while I was pretty addicted to his High Potency Eye Lift. I discovered the Vitamin C Ester 15 serum in the stock room at work the other day and felt like it was the perfect product for me. My skin always reacted well to Vitamin C, which made it seem to brighten and just look more youthful in weeks. So when I read the description, “An unprecedented 15% maximum concentration of Vitamin C Ester designed to boost collagen and deliver dramatically brighter, firmer, smoother skin.” – I was hooked! Vitamin C is one of the best things we can feed our skin. It does a lot including brightening and evening complexion, increasing collagen production which leads to firmer and stronger skin, reversing sun damage, and smoothing overall skin tone. This makes it perfect for using during the day under a great sunscreen. 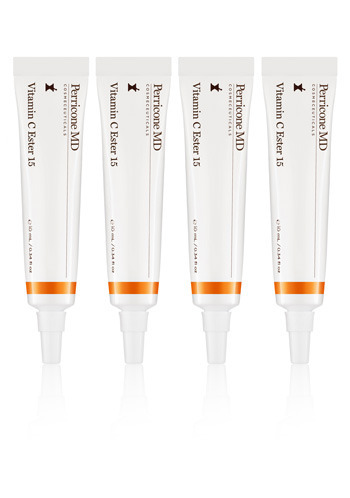 The kit comes with four .34 fl oz tubes to maintain efficacy (Vitamin C can oxidize and lose efficacy over time – so I really appreciate the thought behind this). They come out as a very light white cream that smells ever-so-slightly like orange peel. The cream spreads evenly and absorbs relatively fast. Unlike some Vitamin C serums, this didn’t leave my skin red so that was a relief especially for something with this high of a Vitamin C concentration. The primary area I focused on was around my cheek and mouth. I developed what I believe to be thin skin lacking some collagen due to my years of drinking everything with a straw (my brother is an orthodontist so all this stuff about staining, enamel wear, etc really gets to me). It has been roughly 40 days since I started using this and I noticed that my skin just looked healthier. Areas that I wanted to target for aging signs seem to have been held back a little. It won’t iron away fine lines but it’ll delay and gentle pull back the hands of time a little bit. I no longer notice weak fine lines around my cheeks/mouth area when I make the fish face and the area seems to have become a little bit thicker. Ascorbyl Palmitate and Isopropyl Palmitate are the main sources of this fat-soluble Vitamin C. Because of this, I actually apply the serum with a facial oil rich in plant omegas at night to make sure it gets delivered deep down. There are some not so great things in here such as PEGs, Silicones, synthetic fragrance, etc but I didn’t have a bad reaction to it. And for those of you who don’t usually use clean, natural products anyway, this is actually better than what you’ll find on most department store beauty counters. The product retails for $120, and can last roughly 2 months with moderate use. The results are fairly good and for people who respond really well to Vitamin C, this is one of the most concentrated clear-cut products on the market.